Hi everyone, it feels like forever since I last uploaded any news on the site, and it actually is!. For good reason though. I have been working on a very exciting piece. This year is the 40th anniversary of the Legendery Mr Men and Little Miss. 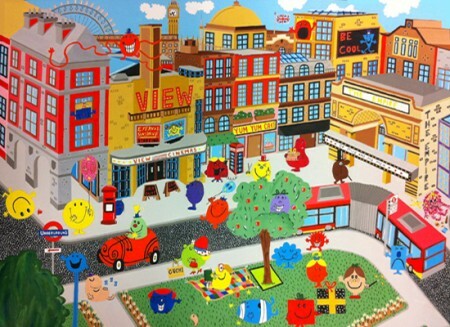 I was asked by the art publisher I work for, who have the licence to produce artwork for the Mr Men, to produce a London piece involving all the characters in my own interpretation. So here it is! my image shows all the characters in a London square creating havoc. In the background you can see Big Ben and the London eye in all their glory. The little rascals are always creating havoc where ever they go, and this time is no different!. The image is going through the approval process, but I am aloud to show my interpretation of these fun little guys!. Next up for me? I ‘m already hard at work on my next piece, which is going to be a new city scene. Back to my bread and butter. Its going to be of Amsterdam! I’m nearly done with the drawing process, so the painting will begin soon. Catch you guys soon with my next image!